While Mahaviira Jain was perhaps the first person to denounce casteism, it is Buddha who propagated these ideas to the common people. Buddha was an existential or spiritual revolutionary because he became a monk in order to remove suffering rather than to escape it. He learned Samkhya yoga under the Adivasi sage, Sainjaya and attained the final goal of this yoga. However, he remained unsatisfied, as he still could not understand or remove world suffering. This compassionate thirst resulted in his true enlightenment. The effulgence of this enlightenment caused ordinary people to become transformed by his presence. Rather than using his enlightenment to become a high priest, he used his spirituality to create a moral revolution in Central India. For the first time, dharma was not based on the ritual purity of animal sacrifice (as in Vedicism and Confucianism); dharma was based on one’s actual conduct. For the first time, morality was demanded of all people, regardless of the caste or class. This also resulted in a partial social revolution. 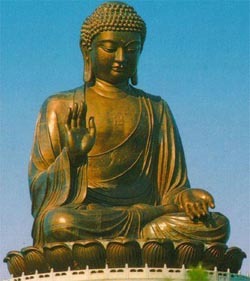 Buddha created the first spiritual order in which there was equality amongst all races and castes. Buddha was the first to reason and dialogue with the common people to make them realize and condemn the irrationality of caste discrimination, the futility of religious rituals and the barbarism of ritual animal slaughter (yajina). The commitment to rational, collective discussion of ideas rather than blind faith in religious authorities was a genuine ideological revolution whose power is still felt today. Buddha’s monastic, social revolution led to evolution amongst the general populace. However, during the Buddhist age, there was equality in spiritual rites but inequality in the social order. After the Kśatriyas (warriors) and the Vaeshyas (merchants/capitalists) were initiated by Buddha, they still retained their caste identities. There was even fighting between the Kśatriyas and the Vaeshyas after the death of Buddha for the ashes of Buddha’s body. The king of Magadha said that since Buddha was a Kśatriya he must have the ashes because the ashes must be inherited by the Kśatriyas. Despite the lack of social equality due to the rejection of householder life, the impact of Buddha’s moral revolution has never been equalled in human history. Countless social reformers have come and gone, but none could create a moral revolution as Buddha did.